In the spring of 1909, a period of activities began which lasted several years, due to the mining and railway activities. 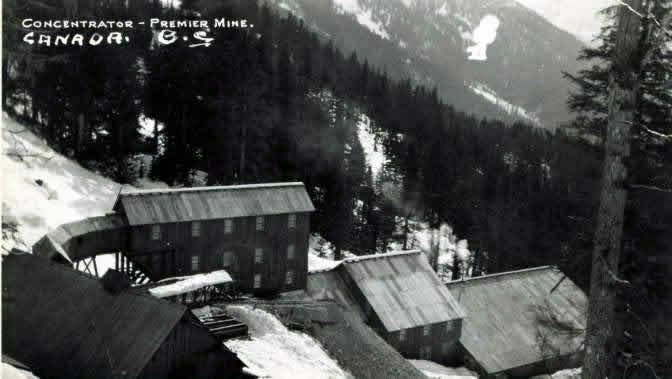 The town grew rapidly, and there was every reason to expect that the growth would continue: but various adverse factors prevailed, and dull times followed, until 1918, when the Premier Mine began to prove its riches. During the boom period, in the expectations that a road and railway would provide access into the Nass valley and the Groundhog coal areas, hundreds of thousands of acres of coal and agricultural lands were located. Extensive prospecting and development work was done on a number of coal seams and a large potential coal area demonstrated. Several farming and stock raising enterprises were also projected. But, with no improvement in transportation facilities, operations in the coalfields ceased. And the Nass valley still remained a wilderness, with the exception of a small section at Aiyansh about sixty miles from the mouth of the river, where a small settlement was started some thirty years ago. In the early days of the town it was realized-as it is today that its future depended largely on adequate lines of communications being established with the interior. Many efforts were made at different times to induce government to construct a highway into the Nass, but although some success was achieved in building a horse trail and additions and improvements made from time to time, the long promised road, suitable for wheeled traffic, is still nonexistent. The lack of this highway has largely retarded the development of the district, and rendered still unproductive a territory that long ago should have been brought into production. With the failure of the railway enterprise and lessening mining activities, a period of depression set in, and the population of the town dipped to less than one hundred. This was a sad setback to the hopes of those who had placed their faith on the exploration of the mineral wealth of the district and the extension of the railway. The construction of the railway would have continued in 1914, had not the hostilities prevented the capital arranged for being obtained, and Sir Donald Mann’s plans for another transcontinental railway brought into fulfillment.